Munich - Since announcing his arrival among the game's elite at the 2004 UEFA European Championships with the Netherlands, the sight of dribbling at full speed and leaving defenders in his wake has enthralled fans the world over. The last time these two sides had met, it had been an extremely one-sided Bavarian derby, with Bayern opening up a 3-0 lead inside 24 minutes, before strolling on to win 4-0 back in April. Nürnberg were determined to frustrate their hosts this time around, however, and a palpable sense of frustration in the Allianz Arena preceded the opening goal, scored in the second half by Franck Ribery. 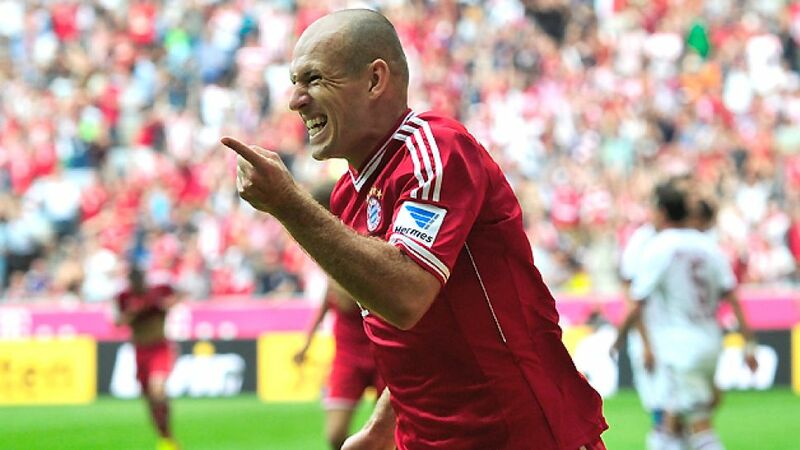 It was followed by a huge exhalation of relief from the home fans, and a wonder goal from Robben. The Chelsea clash represents the next opportunity for Guardiola to lift some silverware as the Reds’ head coach, in a competition he won twice with FC Barcelona in 2009 and 2011. First up, though, it’s Freiburg away, an “uncomfortable opponent” according to Schweinsteiger and a game that demands their entire focus at present. “We have to put Chelsea out of our minds," said the Bayern No31. "We’re professional enough to know we have to focus on the game in hand, which is against Freiburg. They’re a strong team at home and they’ve improved a lot in the last few years. It could well be another game where we have to show the type of patience we did today.” In all likelihood, it won't be the last either.